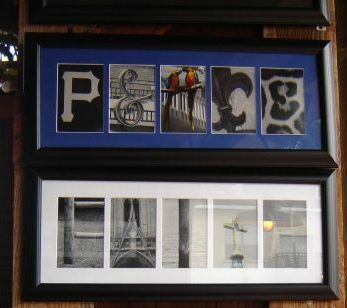 At BestGiftIdeaEver.com, customers choose local photographs that resembled letters of the alphabet to spell out different words of their liking. They spell out their first or last name, business names, or general words such as “Family” and “Welcome”. This personalized artwork will allow you to create a custom keepsake for a loved one, celebrate a bride’s new last name, a couple’s many years together, the birth of a child, or a graduation. All of our artwork uses custom made wood frames, TruVue glass, conservation quality matting and 1/8″ foam backing board. All of our photographs are professionally printed on Kodak Professional Supra Endura VC Digital Paper. Please stop by or check out our website to create your artwork and see descriptions of where the photos were taken!